The Defending Champion was given a scare by the reigning Seniors UK Champion! Indeed Ronnie had to fight back from 4-1 down to beat Ken Doherty in a deciding frame! Ronnie didn’t play well at all at the start of the match, missing easy balls, especially when playing left-handed. But he stuck in there and gradually improved. His opponent, Ken Doherty was playing very well, he was fast and fluent. Ronnie could easily have been 4-0 down at the MSI. The key was that he never gave up and eventually found some form. Ronnie’s comments about the possibility of a breakaway tour will certainly ruffle some feathers. I’m not sure how serious he is about it, nor how much he’s thought about what it would take to do that, in terms of organisation, sponsoring, money, logistic, to mention only a few aspects. And I can’t see many players, top players, taking the risk to be excluded from the main tour. The way I see it, it’s a way to express his dislike of the way the tour has evolved in recent years, not giving the top players the respect he think they deserve in his opinion. Totally deserved praise regarding Ken Doherty at that stage. Ronnie O’Sullivan survived a major scare by battling from behind to edge past Ken Doherty 6-5 and reach the UK Championship third round. The defending champion looked like heading out as Doherty led 4-1. O’Sullivan responded in style with breaks of 75 and 76 on the way to claiming four in a row, but Doherty hit back to force a decider in York. Both players had chances in the final frame, but the Englishman held himself together to go through. O’Sullivan, who turns 43 on Wednesday, is aiming for a record seventh title in the event. He is currently level with Stephen Hendry on 18 ‘Triple Crown’ victories – a name that covers the World Championship, UK Championship and Masters. Despite easing past Luke Simmonds in the first round, O’Sullivan said he “really, really struggled” during the match with illness. In a repeat of the 2001 final, in which O’Sullivan thrashed Doherty 10-1, ‘The Rocket’ was going the way of former champions Mark Selby, John Higgins and Shaun Murphy, who have all suffered surprise exits before the third-round stage. Irishman Doherty’s quick-tempo start with 66, 76, 77 and 71 put him in a commanding position – with O’Sullivan’s highest break just 31 at that stage – but two missed reds to the right corner proved critical as the champion sneaked through to face China’s Zhou Yuelong next. “Ken played fantastically well in the first part and the luck turned a bit, I got a couple of nudges and got into the game,” O’Sullivan said. “I didn’t do a lot wrong but he played so quick and positive, it kind of puts you on edge. “Sometimes you have to win when things are not going well. I felt nervous because I’ve got a love back for it. “You feel like a gladiator. Money can’t buy that. Imposing yourself on a game is as near to a gladiator as I get and that’s why we play this game. Doherty, now 49, who won the world title in 1997, said: “It was a great match to be involved in. When I went 4-1 up, I was feeling great. Even at the end it was just a great atmosphere. He came back very strongly as you would expect and played some great stuff at the end. “I just wanted to go out and enjoy it and not put too much pressure on myself, be as competitive as possible. I couldn’t believe how relaxed I was, I was loving the atmosphere and the chance to challenge myself and Ronnie on the big stage. 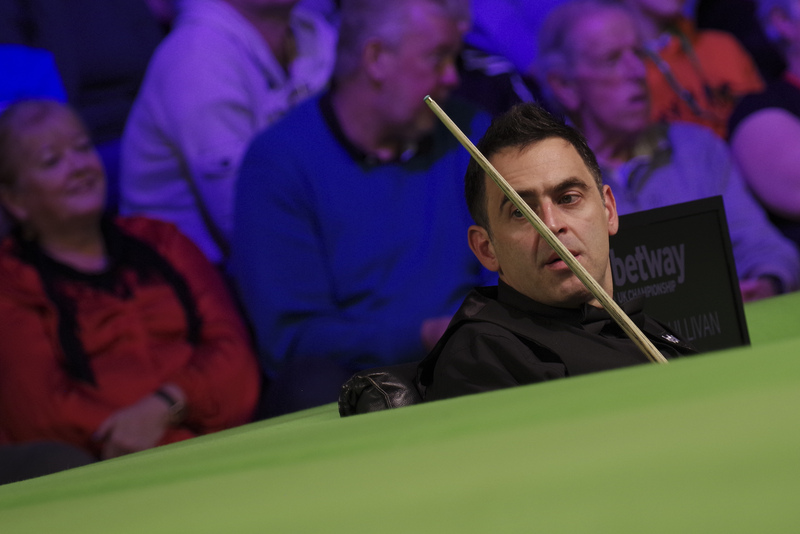 Six-time world champion Steve Davis: “Ronnie has weathered the storm today. A couple of positional shots and cuts have gone wrong for Ken, but it’s tough at the top. Only a player of Ronnie’s ability would have been able to turn this around. “It would have been easy to have baulked but Ronnie has turned this around in great style. It would have been very easy for him to have said he had a black day and that nothing had gone right. Seven-time world champion Stephen Hendry: “Ken had nothing to lose and nothing to expect from this match but he will be very disappointed. He will know he had chances to win the match, even in the final frame. Ronnie will play Zhou Yuelong tomorrow afternoon. In my opinion Ronnie should stay calm for a while. His ongoing controversies with Hearn made him get nervous at the end. I believe that it affects his mindset and his game. In the early 5 frames against Doherty he was totally not concentrated, and his left hand shots were embarassing. Ronnie is a very sensitive person and when he get angry he‘s not capable to play relaxed, as Doherty dif yesterday, and to stay focused on his game. And if he has to make polemics with Hearn, maybe it‘s better to do it between the tournaments. Totally agree. Right now this “breakaway tour” looks like madness to me in so many ways that I can’t even start to enumerate (just for taste: he is looking for players tired of traveling, and therefore wants to go to Dubai for example, or the involvement of players banned for match-fixing, all this looks like lunacy to me). Maybe I missed sth, but I don’t even understand what makes him so unhappy now, but I wish he just focused on the job at hand. Doing well here and in Scotland he’ll go to the 3 ITV-events he likes, because they have top players or players who did well this year, so there you have it, no 128 player-draw, so yes, I wish he calmed down a bit. I agree Csilla. Just one thing, I don’t think that it’s the traveling itself that bothers Ronnie so much, it’s the rushing from one tournament to another, sometimes across time zones, without time to rest, practice and prepare. Last season he played in Coventy, reached the final, dashed to Shanghai, had to play two matches on his first day, won the title, came back and staight to Belfast to play in the NI Open. That’s madness. Ronnie doesn’t seem to be in a particularly good mood this week, though maybe that’s just related to his virus. His draw is reasonably favorable the rest of the way, with the exception of possibly having to meet Lisowski in the L16 and Trump in the SF. Yes Ken carried on the form he showed in the first round. Of course, my impatience for new players to come through meant I would have preffered to see Yuan Sijun and Zhao Xintong playing the top seeds. I don’t know if Ronnie’s poor play at the beginning of the match is a bad sign going forward. As for a breakaway tour, even with just a few players, it could be viable. There are some great players around, jaded with the tour, who might actually prefer to play competitive matches, rather than traditional knock-out tournaments, perhaps in a 4-player or 6-player league format. As I’ve said before, World Snooker could embrace such a thing, with matches being ranked, or (more likely) they could reject it and exclude the players involved. Perhaps we should have a referendum?